If the Future has any remedy for this situation, do not hesitate to provide it. That is to say, Ike and Claire Wanzandae, HELP! HELP HELP HELP. I am (perhaps not for long),Benjamin Franklin Ike Saturday has seen better days. 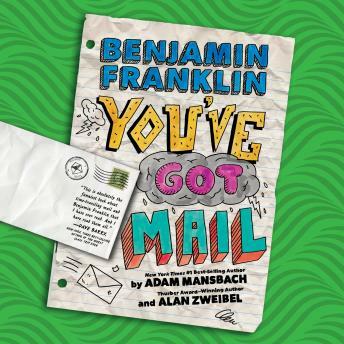 For one thing, his pen pal, Benjamin Franklin (yes, that Benjamin Franklin), is the target of an angry mob after Ike's plan to help the Founding Fathers with some intel from the future seriously backfired. For another, he's decided to mail himself back in time with the help of his girlfriend, Claire Wanzandae, and it's not a particularly comfortable way to travel. Once Ike tracks B-Freezy down in 1776, it becomes clear that his pal is less than impressed with the irritating, modern-day rescuer, partially because Ike has a habit of making things worse for Ben, and partially because Ben is incredibly cranky when not in the presence of numerous meat pies. Which speaks to another issue for the pair: they have no money, no food, and basically no plan for saving the country. But Claire won't be able to cover for Ike back home in the future forever, and the British are looking pretty impatient, so Ike and B-Freezy will have to come up with something quickly if they want to avoid an epic, history-destroying disaster. In this hilarious sequel to Benjamin Franklin: Huge Pain in My . . . , Adam Mansbach and Alan Zweibel take Ike and B-Freezy's antics to the next level as this ill-paired (and sometimes actually ill) duo hold the future of the world in their not-so-capable hands.